A man who was caught by Gardai hiding in a wardrobe after robbing two houses has been stabbed before he was due to appear in court yesterday. Matthew Lafferty, 19, stole a laptop computer, television, a DVD players and jewelry when he burgled two houses at Wolfe Tone PLace and Ard Lohan, Letterkenny on February 3rd last. 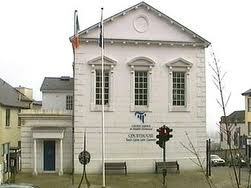 Lafferty, of 35 Fairgreen, Letterkenny, appeared in court last week facing burglary charges. The court heard how a woman had interrupted Lafferty and another man when they were upstairs in her house at Ard Lohan. She ran to call the Gardai and Lafferty was found in a wardrobe in a friend’s house also at Ard Lohan. Lafferty was put on bail and ordered to keep a night-time curfew by Judge Paul Kelly to appear at Letterkenny District Court today. However solicitor Patsy Gallagher told the court that Lafferty could not appear as he had been seriously injured after being stabbed. Inspector David Kelly said three suspects had been identified for the attacked and the investigation was ongoing. Solicitor Patsy Gallagher said his client had been hospitalised after the attack but had been released. Judge Paul Kelly ordered Lafferty to appear in court again on Thursday, February 16th.